What kind of first impression do you make? Can you hack it? They take seconds to make, and are a combination of our nonverbals- everything we communicate about ourselves through what we wear, how we interact with our environment and our body-language. The feedback I give in coaching is based on research (not just personal opinion). The main theme is: What kind of impression do you give, and do you want to give that impression? This one is simple in theory, but might be more of a challenge in practise. 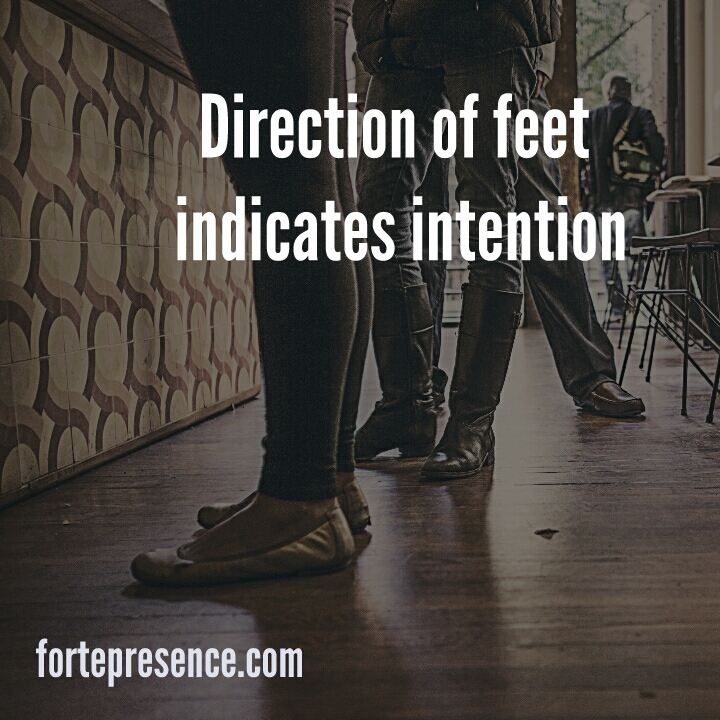 Try directing your conversation partner to a positive emotional state. If you’re determined to stay positive when your conversation partner is not, that would indicate that you are emotionally insensitive. It can be a big challenge, and a very rewarding one, to find out what makes someone light up with interest. No one really wants to talk about the weather. Inspired by TED Talks, here are some questionsto start a better conversation inany situation. The basic idea: Dictionaries don’t compile themselves — linguistic sleuths called lexicographers do — and in order to keep the modern dictionary accurate and dynamic, they need be open to new words and formats. They also need your help. Fun facts you’ll learn: How lexicography is like archaeology; why there’s no such thing as a “bad” word; and the definition of “erinaceous” (hint: it involves hedgehogs). Scoot to 3:58 for that. 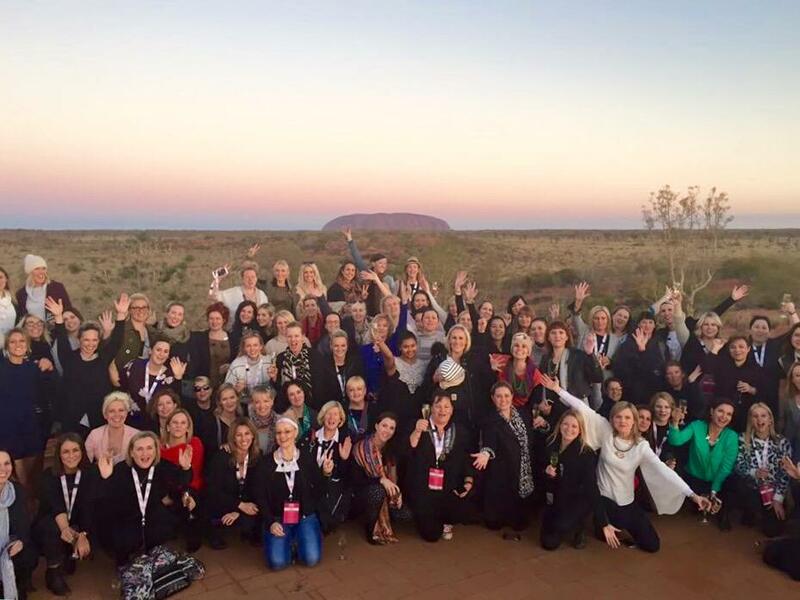 Last week I had the opportunity to go to Uluru as part of Business Chicks‘ Movers and Breakers conference. In meeting 80+ people, (well, I didn’t meet that many, but I tried!) there were resources I use in my coaching and group workshops that came up again and again. A book on body language for business as a tool for greater understanding and opportunities to communicate better. 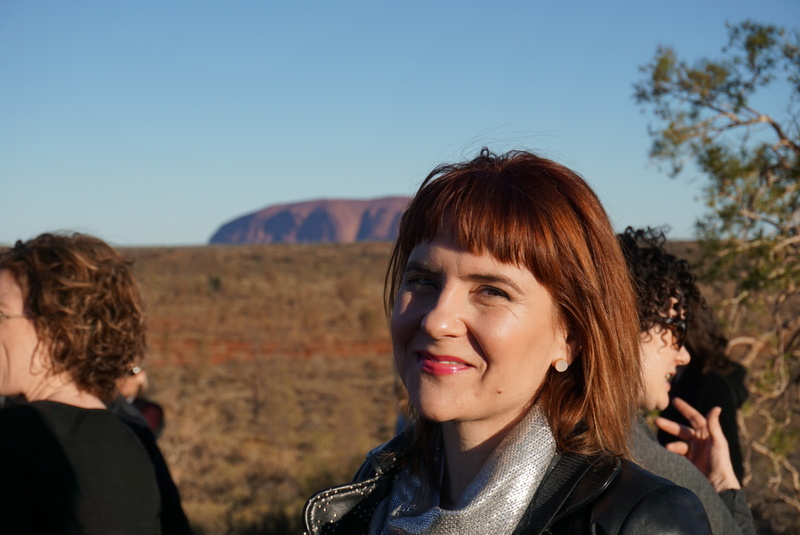 One of the many things I love about the work I have the privilege of doing is that it comes from evidence-based research- which means there are a stack of resources I’m delighted to share that are low, or no-cost pathways to increasing confidence, communication and resonant leadership. Inspiring Leadership Through Emotional Intelligence is a free online course though Coursera. It runs again in September, but I think you can sign up and watch the videos and read the readings until then. There is a book, Becoming a Resonant Leader connected to this, and the conference inspired me to start working through it with a study-buddy. This came up a lot when discussion increasing confidence in public speaking situations, or speaking up in meetings. I wrote about top three tips to get off the emotional rollercoaster of stage-fright earlier this year. It’s Amy Cuddy’s research that led me into further reading on an area that informs a lot of my current work, Embodied Cognition, which looks at how what we do with our body impacts on our thoughts and behaviours (try Sian Beilock’s How the Body Know Its Mind for more on this). Deeper understanding of nonverbal communication for negotiations and conversations in business. Gone are the days of the 80s where body-language was a party trick. These days, we call them nonverbals, and Ex-FBI specialist, Joe Navarro consults regularly with fortune 500 companies, and watches the nonverbals as part of due diligence. His book, Louder Than Words is directed specifically at the world of work. Top tip for making learning stick? In my studies as an educator (the beginning of a masters in education, part of studies in tertiary teaching when I was lecturing at universities) I learned that all the recent data points to this one thing: We learn better, and retain information better when we are in a community of learners. That’s why I have a study-buddy for the Becoming a Resonant Leader workbook, and why I often initiate a community of practice around things that are important to me (songwriting, bands, meditation). I also know that at some conferences, we can learn things that have the potential to change our world if we let them. We have a much greater opportunity to sustain that change if we are supported by others. Grab a friend (or few) check out and share the links above. They are low-cost, or even free, and will help you become a better leader and communicator. 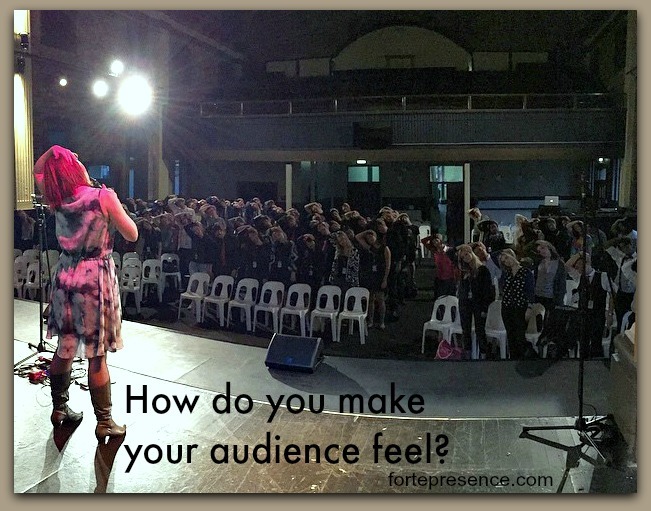 How Do You Make Your Audience Feel? I get a lot of requests to help people feel more confident speaking in front of an audience. We work together on everything from preparation to content and nonverbals (body language). It’s not all about you, it’s all about your audience. What are audiences looking for when they are ‘looking at’ you in a presentation? They are looking for information that supports their understanding of what you’re saying. For example, if you tell them you are happy about something, it helps if you look and sound happy about it. Ideally, your audience wants you to help them understand what you have to communicate. And they are hoping that you will keep them interested. I explained to Liz that when I first started singing when I was nineteen I was terrified of the audience. I remember my singing teacher, Andi Garing, coming to one of my early performances at a small bar, the Maluca Bar in Gertrude st, Fitzroy. If only they would stop clapping, I can get back to singing. Wisely, my teacher suggested that I acknowledge the applause (something most people, even professional public speakers forget to do). At nineteen, before a performance, I was so nervous, I would change my outfit about ten times before the gig. I’d get to the bar and have a drink of wine or vodka to try and settle my nerves. Then I’d be so worried about feeling too sleepy that I’d follow the drink up immediately with an espresso coffee. In retrospect, it wasn’t a particularly productive pre-performance routine, and did nothing to calm my nerves. Performing was such an emotionally harrowing experience, that I put an enormous amount of research into finding ways to master the mental and physical tools for positive performance. How do you want to make them feel? ‘What’s in it for me?’ That’s what the audience wants to know. It takes the pressure off you to present brilliantly, and to think mainly about the needs and interests of your audience instead. What would be the opposite of self-consciousness? Consciousness of others? Perhaps lacking self-consciousness is all about thinking about others. 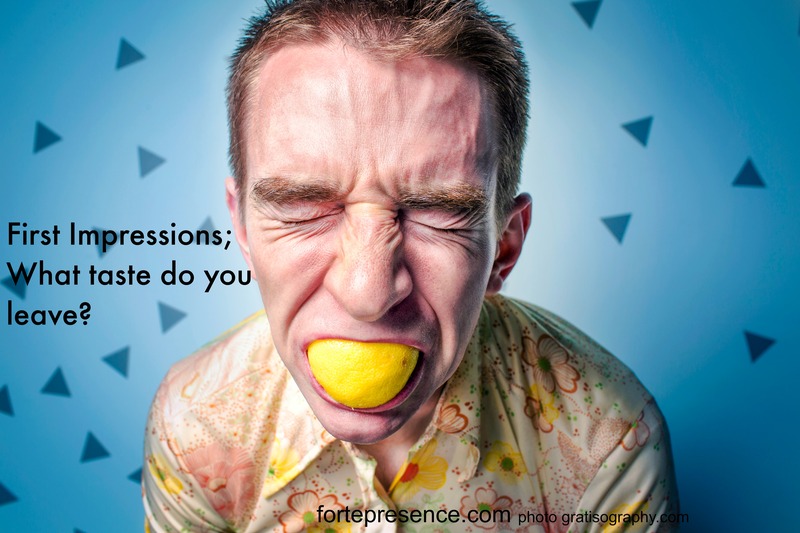 What can you do for your next presentation to consider how you want your audience to feel? How do great leaders make others feel? No matter where you are, if you think about making others feel comfortable, and connecting people with one another, you are leading. In this meeting with a very talented HR professional, and a highly regarded leadership coach, we were talking about what makes great leaders. It was this idea of being a great host (or hostess/’hostess with the mostest’) that resonated with everyone. 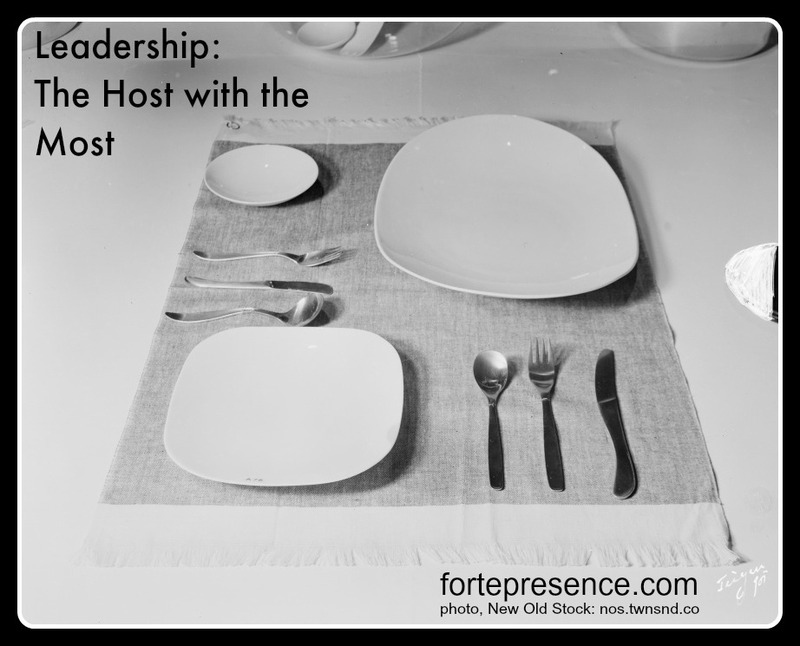 If you thought about yourself as a host, as much as a leader, what would you do differently? We sum people up in about three seconds when we first meet somebody. It’s tough. We would all like to be understood for our true selves, but that often takes a lot more time than three seconds. What do your nonverbals communicate about you? Where do you stand in relation to the ‘norm’ of your group? Do you need to amplify, or balance something out? I once worked with a tall, handsome and fit mortgage broker on his nonverbals. 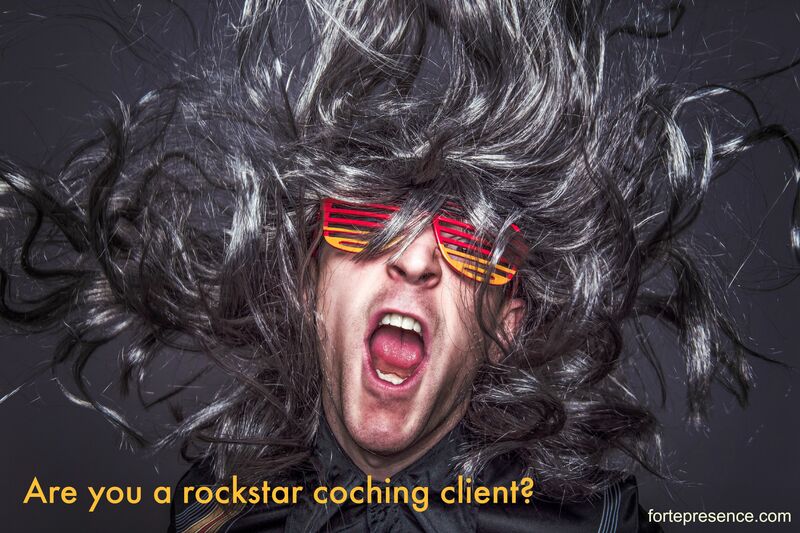 He needed to communicate trustworthiness, warmth and credibility straight away to new clients. With a large build, and over six feet of commanding height we needed to balance these elements out with warmth so that his stature wasn’t intimidating. How can you find out how others perceive you? Ask. Often people I coach have been given feedback repeatedly about certain elements of how they are perceived. If you hear something more than once, it might be worth paying attention. If you were to be played by an actor, how would they need to dress, talk and hold themselves to accurately portray you? Again, ask someone you trust. Once you have some information, you can make choices about how you want to be perceived. 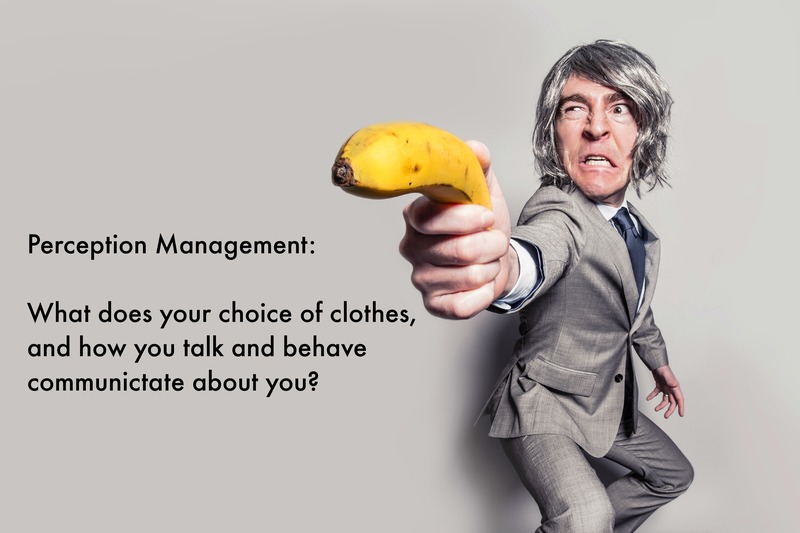 If someone says that you appear intimidating, and dress like a mafia boss, it might be time to look around your office and take note of what others are wearing- then get a friend to take you shopping. Unless you are a mafia boss… then you can be secure in the knowledge that nobody has to stretch their imagination to see you how you want to be seen. What top 3 nonverbals communicate leadership? From the great ape to the peacock, when we demonstrate leadership (though we call them dominance cues in the nonverbal world), we take up more space. Who spreads out their belongings across the table? Who has a wide stance? Who drapes their arm over the chair next to theirs? Think of a movie where the king or queen enters the room. Is is faster or slower than those around them? This may be a reflection of how our body reacts when we get into a power pose. Our sense of competence rises, with an increase in testosterone, but it’s the reduction of cortisol that is most interesting because it reduces our reactivity to stress. If we are less reactive to stress, we can make better decisions, and this makes us stand out as leaders. A funny thing happens when we experience a stress-response. Our instinct is to protect ourselves. It’s a good instinct to have if we are about to fall over…we can protect our vital organs, and do less damage to ourselves as a result. Unfortunately, this reaction kicks in when we are presenting in front of groups of people, and it means we restrict our gestures. We also restrict our gestures when we are lying, or do not have full confidence in what we are saying. For most presenters, that means that if we are to look more confident, we need to practise larger gestures to support our content. Try to get some space around your armpits at some point during your presentation. This will help to remind you to open up your gestures. This video contrasts Hilary Clinton and Michelle Obama speaking, with the nonverbals commentated by Joe Navarro.